Hang Your Keys Like A Rockstar With The "JACK RACK"
Pluginz is pleased to introduce their hottest new product - the latest musician's must-have - the "Jack Rack"! Already making a name for itself, this unique, eye-catching wall-mounted keychain holder is the most rocking way to "Hang Your Keys like a Rockstar"! The "Jack Rack" is a great gift idea. As a music fan or just someone who wants to organize their keys (who doesn't? ), several "Jack Rack" designs can be purchased from www.thejackrack.com, starting at just $29.99. There, you can also buy the individual "Jack Rack" Pluginz keychains, as well as lanyards, necklaces, gift cards and more. Stuff your stockings with the "Jack Rack" this upcoming holiday season, surprise your friends with a unique birthday gift, or treat yourself to a cool, handy decoration for your living space! Not only can you buy your own "Jack Rack" via Pluginz, you can customize them for your business or brand, too. Artists and reputable companies in the music industry are already creating their own custom Pluginz "Jack Rack" designs after witnessing the personalized nature of the product - allowing them to further promote their brands with a fun and functional twist. To find out more on how to customize your very own "Jack Rack", email Pluginz at: contact@pluginzkeychains.com. Pluginz was founded in early 2015 by Mike Stricklin. 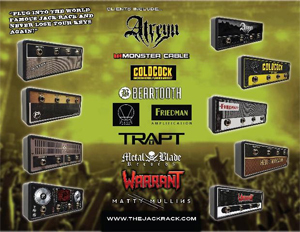 Stricklin soon partnered up with Rockworld Merchandise owners Dan Jacobs of the band ATREYU, and his brother Joe Jacobs. After a successful Kickstarter campaign that raised over $10,000, Pluginz started making a buzz within the music industry. Soon after, the "Jack Rack" went viral on the front page of Reddit, as well as breaking records for post likes, comments, and shares on pages such as Guitar World, Revolver Magazine, Shut up And Take My Money, Celestion Speakers, 100.3 the Sound FM, Alt 98.7, OC Weekly and many more. Pluginz continued to gain steady momentum throughout the year, adding reputable artists and bands to their growing roster, as well as collaborating with famous brands and companies within the industry. 2016 has a lot in store for Pluginz, as the company continues to grow and spread the word about the "Jack Rack" across the globe! Make sure to catch Pluginz and the "Jack Rack" at Winter NAMM 2016. "I love music! I love everything that has anything to do with music. It's my first love and my world," states Pluginz partner Dan Jacobs. "A year and a half ago I was presented with the idea of the "Jack Rack" by our now partner Mike Stricklin. From the moment I saw the idea, my love for music knew it was something special and wanted to help develop it into something as great as the idea itself. With the help of my brother/business partner Joe Jacobs, a successful Kickstarter campaign, and some #1 love from Reddit, we have grown the "Jack Rack" into something that rocks harder than we ever imagined! 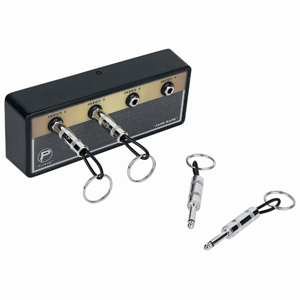 It's the perfect way for any music fan to hang their keys like a rockstar and never lose their keys again. We've come so far to where we now have the honor of working with actual amp brands and bands that we love and respect. The world is a cooler place with the "Jack Rack" in it and I'm honored to say that I had a part in it."